Protect Pollinators. With these new Forever stamps, released on August 2nd, It’s all about the bees and the butterflies. Here, the monarch butterfly and western honey bee symbolize the thousands (yes, thousands) of native bees, hover and flower flies, beetles, wasps, butterflies, and moths at work throughout the Northeast, and across the continent on behalf of — well, there’s us, of course. Two iconic pollinators. Four iconic wildflowers. Thank you, USPS. In the U.S. roughly one-third of all food crops depend on pollinators. And of course, we do love our flowers. But it’s not just about us. It’s about biodiversity. Consider habitat fragmentation. Example? One house at a time, a forested tract grows houses. Then five at a time; then 10. Then maybe more and wider roads, more and bigger buildings. Fewer and fewer flowers — and their pollinators. And habitat loss is a biggie. It makes for less forage, fewer nesting sites. For losses in abundance and diversity. For reduced genetic diversity — and increased risk of extinction. 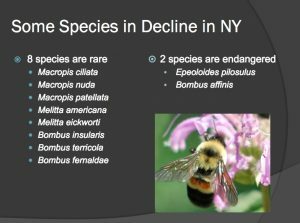 Here in New York, among bees alone two pollinators are endangered and eight more are rare. Going, going, gone? Image courtesy Emma Mullen. And monarch butterflies? Starting in late summer, monarchs focus on fattening up to prepare for their epic, multi-generational migration to their overwintering site in Mexico, and it’s nectar they need. 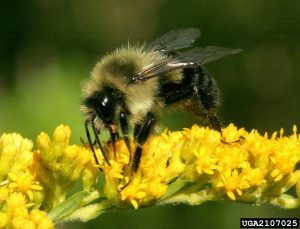 But a lawn won’t fatten them — or help other pollinators make it through the cold of a northern winter. Perhaps it’s time to consider making of your lawn an ornament of sorts, beautifully framed with flowers and meadows. Among core values of IPM: building biodiversity. Why? Biodiversity is at the heart of healthy ecosystems. And healthy ecosystems keep us healthy too. 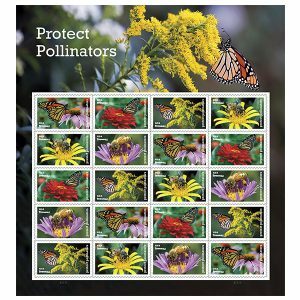 So we thank you, USPS, for reminding us of to the beauty and importance of pollinators. 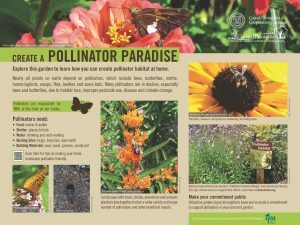 All pollinators, and the biodiversity that supports them. It’s BioBlitz time. Beginning on Earth Day (Friday, April 22) and running through Migratory Bird Day (Saturday, May 24), hundreds of Audubon International-certified golf courses are hosting events for golfers, their families, their friends (kids too) — to see who can find and ID as many plants and critters (bugs and mushrooms count too) as they possibly can. 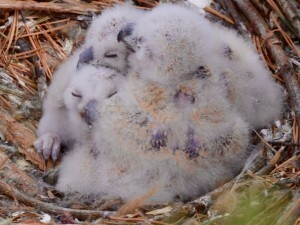 Fluffy owlets have a home at Bethpage State Park’s golf course. Photo courtesy Audubon International. In fact, any golf course in the world is welcome to participate. Most will have skilled group leaders on hand to help with ID or offer a pair of sharp eyes and ears to help people distinguish among the range of plants and animals whose homes border on fairways and roughs — especially those rare or endangered species. And prizes? There’ll be prizes — but the biggest prize of all is engaging local interest, understanding, and support of the environmental advantages golf courses can provide to their towns. 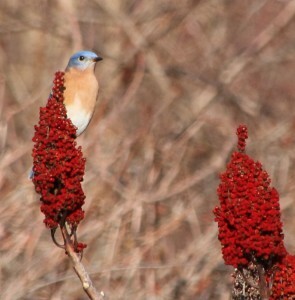 Staghorn sumac at Bethpage State Park provide great winter food reserves for songbirds. Photo courtesy Audubon International.